Stowe gives Toby Bloomberg a gentle nudge to start tagging. When Toby and I met last week in Atlanta we talked about tagging. One of Toby’s concern was that blogging and the tools used to create blogs are becoming too complicated. To paraphrase (please correct me if I got this wrong Toby): Blogs started out at these easy things to use, but once the web geeks got a hold of things they started to get complicated. Add a feature here and a feature there and it’s no longer a simple tool. I agree with her. All I need to do is look over the list of plugins and hacks I have installed on MovableType. There will always be the simple tools like Blogger but MT is becoming quite the little CMS tool. Elizabeth is fed up with tagging. She says, “Tagging is too much work.” In the past few weeks I have had a number of conversations with people who share the same opinion. Like many TypePad users, Elizabeth is limited in tagging solutions. Yes you can use your categories to tag your content, but anything further requires inserting the proper HTML into your posts. Moving to MovableType or WordPress is the best option, but not always feasible. A few months ago I documented how I can easily tag my posts within MT. I know that tagging my posts has led to increased traffic from Technorati and other search tools that support tags. Granted it is very easy for me include them in my posts. Over at the Burning Door, FeedBurner has announced PingShot a service that notifies aggregators and search engines when your feed has been updated. On the post there is an FAQ about the new service. If you have a FeedBurner account you will need to activate this service via your control panel. Outside services such as web directories and search tools may submit their name to receive notifications of updates. Google has finally launched a blog search tool. The new service is available at: www.google.com/blogsearch, blogsearch.google.com, search.blogger.com/ and your Blogger dashboard. There is a lengthy blog search help page that details the nuances of Google’s new toy. By default the search results are shown by relevance, although you can switch over to ‘by date’. A search for Katrina on Google showed the most recent post being 3 hours old. The same search on Technorati returned posts that were 5 or 6 minutes old. On a related note, it will be interesting to see ‘Google Blog Search’ as one of the ‘Top Searches’ on Technorati later today. Can I subscribe to search results? Yes. At the bottom of each page of search results you can find several links, offering the top 10 or 100 results as either Atom or RSS feeds. Just grab the links from here and subscribe to them in the news aggregator of your choice and you will get updates whenever new posts are made that match your query. In addition, the Advanced Blog Search offers the standard options for narrowing your search quite a bit. After my initial review last night I have spent some more time playing around with Technorati’s new Blog Finder service. I have also read other reviews by Neville, Tris, Michael and BL Ochman on the new service. To be fair David Sifry did comment on my original post that they’re working on some of the issues I noted. One of the often overlooked aspects of blogs is the ability to find customers. This is especially powerful with specialized topics. Remember blogging is not always about writing! It’s about listening. I have a friend that sells support materials for women who have suffered a miscarriage. She was advertising via Google AdWords on the keyword miscarriage. Now she can do a blog search for miscarriage and find thousands of women talking about the subject. That’s her target market. She can directly engage potential clients via their blogs. Yes, she must approach carefully, but leaving comments offering some basic suggestions and support is the start. In many cases when I am speaking to organizations about blogs I show them how tools like Technorati, PubSub, Feedster and IceRocket can identify potential customers/partners. At a recent lunch-n-learn a company executive said, “I don’t see how we’d use a blog for any marketing purpose.” Before he could finish his sentence I did a search for a keyword within his industry and identified a few hundred bloggers. I then asked how they currently market their product. They were using traditional advertising in a number of publications. How much was the advertising costing? and what were the sales returns? I didn’t really matter, becasue in 30 seconds and at a cost of $0.00 I identified 160+ leads. What other method can match that? I, like many others, am tired of all the talk about blog lists and rankings. Technorati has the Top 100, Feedster has the 500, BlogPulse offers a ranking as part of their Blog Profile. Yes there will always be the top blogs in certain sectors, but the power of the blogosphere is that the next great idea can come from a blog ranked 675,214 by Technorati. During BlogNashville Dan Gillmor said, “Just think if people in nursing homes could blog, what would we learn?” At first my thoughts were of exposing nursing home abuse, but I think Dan was talking about knowledge transfer. All those people with all that knowledge and experience, but nobody to share it with. 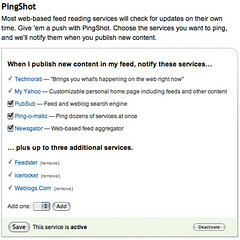 Update 9.1.05 Technorati has launched Blog Finder, a tool to rank blogs by category. I should note that some fake blogs may very well contain interesting and relevant content, which opens a debate onto how useful or valuable they are. This is why I don’t include fake blogs in with Spam blogs (as defined above) because it is debatable that these systems are actually providing readers some value. - Industry players including Amazon, AOL, Ask Jeeves, Drupal, Google, MSN, Six Apart, Technorati, Tucows, and WordPress and others are getting together in the second half of September for the second Web 2.0 Spam Squashing Summit. Related Posts: Spam in RSS, PubSub’s Thoughts, Tag Spam in Technorati, RSS and Blog Spam: A Losing Battle? David Sifry of Technorati has posted Part 2 of his State of the Blogosphere update. Doc Searls just asked about this. A few friends have been having some issues including Technorati tags in their blogs so I thought I would put together a how-to of what I’ve done. The simple modifications I have made to my MovableType software makes sure that any tags I include are quickly indexed by Technorati and other services that utilize tags. Using Blogger? Richard Massoner sent me a link to a Greasemonkey script that helps put tags in Blogger.com blogs. - Include Tags in Your Post (RSS): The tags must be included in the post and not just a part of your blog template. That’s the problem that MindComet has with their blog. They’ve just listed the tags on the blog template and not the individual post. Only content that is part of your post is included in your RSS feed. Items that are part of your blog template are not included in your RSS feed. - Publish Full Text in RSS: If you are not including the full text of your post in your RSS feed the blog index tools will not see your tags. This is because most people put the tag code at the end of the post which is often not included in a partial feed. - Failure to Ping: You have your tags coded correctly, you’re publishing a full text feed but still nothing? You might not be pinging the blog index tools each time you publish a new post. If you are using MovableType of TypePad your blog should be configured to automatically ping Technorati. If you are unsure you can always use Ping-o-Matic! - Technorati is Not the Only Game in Town: There are other blog search tools that are starting to use tags. IceRocket is another blog search that you can ping with your tagged posts. Failure to do both of these will result in your tags not being indexed. Every time a friend contacts me with an issue it’s because they have a problem with one of those items. One of the interesting features of NetNewsWire is that it tracks the changes to items in RSS feeds. If an author edits a post the new items are presented in green and the deleted items in red. Most of the time the changes are spelling corrections or minor edits. Mark Cuban is one great example. Mark will usually make a number of small edits shortly after he originally posts an item. Every once and a while a major edit will take place. The following screen shot is Dave Winer’s post about the Technorati situation. As you can see there have been quite a few changes to the post. At first is was a rant by Dave against Technorati. We’ve all cut them an enormous amount of slack for a long, long time, Doc. I don’t know about the rest of you, but they’ve been taking my data, and snarking behind my back. Everyone says they like Technorati, until you admint that you don’t really, then they fess up that they don’t really either. One too many stabs in the back. Too much snark, not enough perf. They take from the commons and don’t put back. Now it just quotes Doc Searl’s post. Should Dave have made this major change? Obviously he was a bit upset when he wrote the original post, then thought about it, and made the edit. Perhaps he should have kept the original item up and posted a ‘further thougths’ in the same post?